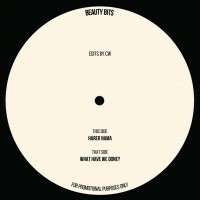 Beauty And The Beat look back on a decade of anything goes, hi-fidelity party exploration with a pair of primo edits from founder CW. Both cuts have been road tested, re-tweaked and tripped out, causing absolute mayhem every time they're dropped. The A-side sets out its own psychedelic soul stall right from the off, infusing a tumbling percussion groove with all manner madcapped FX, clattering breakbeats and phase. Soon enough a slurred bassline and toppy guitar lick pave the way for some pimpin' brass, bringing us (Orange) sunshine on a rainy day and then we're back in the hypno-gogo of those ramshackle drums. One spangled fusion guitar shred later and we're chanting along with Rasa, feeling the full force of a rare groove great. If only all edits were this creative! Thing is, that's only the starter, and things only get better on the flip as C-Dub treats us to the electro-harmonic brainmelt of "What Have We Done", a consciousness expanding cut n paste boasting pulsing prog sequences, chiming guitar, dreamy harp and the occasional burst of disorienting piano. Seeming to unlock both our hips and the global consciousness, this track unites the sounds of French jazz, West African folk, Pacific guitar and German kosmische while maintaining a driving dancefloor groove. Totally psychedelic and completely different to everything else that's out there, this is the most exciting record I've heard in aaaagess!